I’ve always been wary of top-down shooters. They’re like a double espresso, mixed with half a bottle of vodka – something that delivers an experience that is exhilarating for a moment, but then, when the comedown arrives, it hits you very hard indeed. 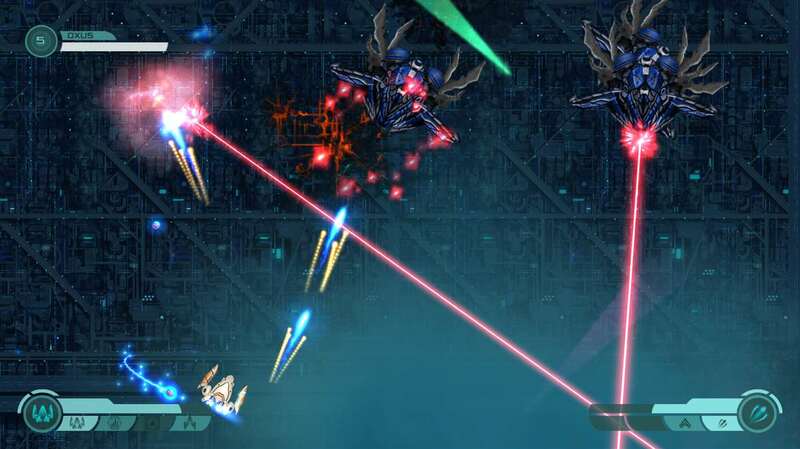 Defenders of Ekron is just like that – the initial thrill of shooting, dodging and having a hundred enemies on screen at once can be thrilling when you’re winning, but when it gets harder and you’ve repeated the same level over a hundred times, it feels like the worse hangover in the world. First of all and it has to be mentioned that this game tries to do something very different within the genre, and that should be applauded. 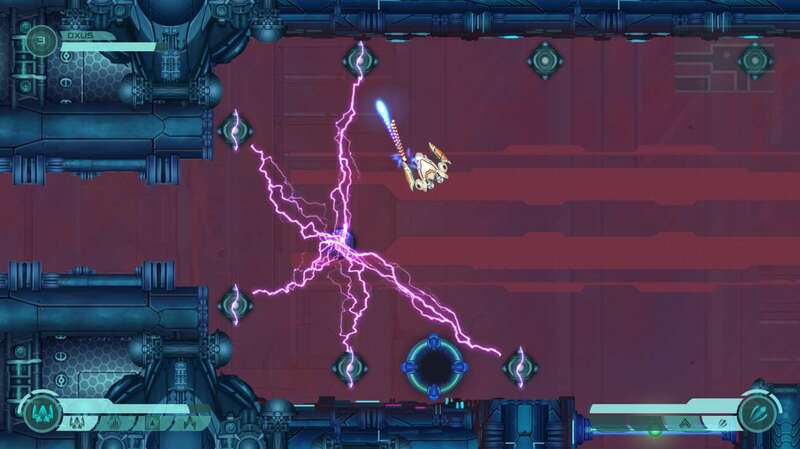 It mixes some top-down shooting, with a dungeon crawler, a multitude of gameplay techniques and a sort of anime influenced story arc. But it is with the actual shooting elements where the problems lie. You play as young pilot Eneas, who is the best of the best when it comes to flight school, but comes across as a troubled young adult who needs to learn the way of control. He enters the army of Ekron, and after a nicely surprising prologue begins his training, learning the skills on offer. But then it quickly turns into a war with huge mechs – and some other things that I’m still not overly sure about – but it all sounds interesting and unique… at least until the halfway point comes about and you get completely lost with what is going on. Fans of futuristic storytelling will love it though. In terms of the gameplay, and again it is a little different to the norm. 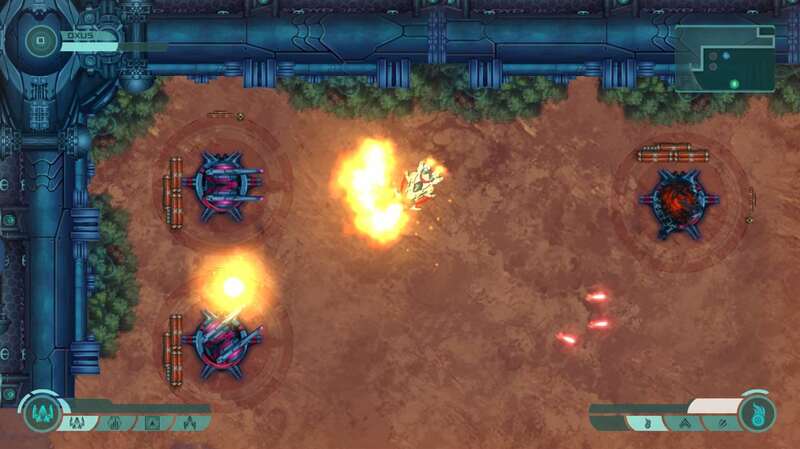 Defenders of Ekron sees you controlling a ship which can quite obviously shoot with its main weapon. However, you can also utilise a special ability like a rocket that can be held in place while you position yourself somewhere else, before releasing to cause the damage. It’s very clever. There are also a number of different modes that your ship can use; the previously mentioned attacking option, that of an exploration mode that is best spent for trawling through some of the more open levels and a scanner that allows you to examine a variety of objects. This all plays out through your base of operations, which acts as host to the headquarters that let you in on the story campaign, and a simulation room where you can partake in little training games to give you more upgrade points. These little mini-games are a lot of fun and quite addictive, allowing you to ensure that your skills and abilities are up to scratch before tackling the tricky main campaign. With the points that you earn, you are then able to upgrade elements like speed, and firepower, in order to make you stronger and better in battle. Defenders of Ekron comes across as just fine, but at the same time, it is nothing remarkable; controlling a ship, taking part in a ton of shooting and seeing some copilots join in the fun and games every now and then. You’ll also find the odd boss battle included for good measure. Again though, whilst this is all good enough, there is nothing that is outstanding and it really does start to get a bit dull in the middle section of the game, especially as you hunt your way through a planet-based section looking for information nodes hidden in ancient artifacts. Yes there are some surprises, but not enough to keep my interest piqued. That may be down to the fact that Defenders of Ekron is a tricky one to get a handle on. See, on one hand it’s trying to achieve something different and unique; in many ways, it achieves this. But there are moments when it just becomes your everyday top-down shooter, one that is in no way as exciting as other games in the genre. Visually and Defenders of Ekron is pleasant on the eye, like a smart-looking futuristic graphic novel. Everything that plays out in the base are all presented via hand-drawn storyboards which punctuate in between missions well, but the actual levels are a bit bland at times. Much of this is down to the rather generic landscapes and enemies that don’t fizz off the screen like those found in a top-down shooter should; after a while you will long to go back to your base to wallow in the visuals there. The soundtrack is strong though, with a good mixture of tracks to enjoy. I don’t think I’ve ever played a game like Defenders of Ekron before; loving it one moment, hating it the next and then loving it again. Its ambition and storytelling is great and it does some really interesting things with the gameplay which, at times, really impresses – especially that found in the challenge rooms. But there are many more times where it becomes very familiar, failing to allow the previously impressive stuff to take hold.